I 100% recommend Jonathan to anyone who has any kind of event coming up! He is a man of many talents and completely made my wedding one hell of a party! Wonderful guy and does great work! Jonathan is amazing. Couldn't have asked for a more professional DJ to work with. His level of entertainment/lighting is one of a kind. He worked with me on changing dates and venues. I would recommend his services if you want the best available because that is what he is. He kept my guest on the dance floor all night and stayed interacting with them. The up lighting he provided made my venue beyond gorgeous. He's the go to if your looking for a DJ to keep the party going! Jonathan was the DJ for our wedding reception & did the sound for our ceremony on December 2, 2017. He is hands down the best DJ around! He did so much to make our day even more special. The monogram, uplighting, & animated projection wall he did for our wedding were amazing. We wanted a winter wonderland wedding & he even made a snow fall animation around our monogram! Jonathan kept the party going all night. There were not many moments during the reception where people weren’t dancing & no one wanted to leave when it was over. I would recommend Jonathan to anyone, he is the best! Very responsive to my messages, considering i would send them at all hours with a ton of questions! Honestly, the easiest vendor we worked with out of everyone we booked for our wedding. Also, after the wedding was over, i had so many people compliment how fun Jonathan made the whole event and how awesome his music choices were! Loved the uplighting he provided. Best DJ we have ever had for anything! He comes highly recommended by my wife and I! Jonathan was on the ball every step of the way! Very easy to work with and great at getting back to you right away when you had questions. We were worried about getting an older crowd engaged in dancing at our wedding but Jonathan worked his magic and our guests were jumping up to get on the dance floor without hesitation! He kept them engaged throughout the night and was an excellent DJ! Great value for the money considering all the extras and available options that he brings to the table! You will NOT be disappointed if you decide to go with Jonathan. I would go with him again in a heartbeat and will be recommending him to anyone I know getting married. Jonathan is one of a kind! There is no party like a finest events party and trust me, with Jonathan, you will have the FINEST EVENT! I have been to my fair share of weddings and no one brings the house down like Jonathan, not to mention all of the bonuses you get from him. He is so much more than a DJ. He does uplighting, personalized monograms, and SO MUCH MORE! Trust me, if you're planning a wedding or an event where you need a DJ, YOU WANT JONATHAN MIHELLIS! 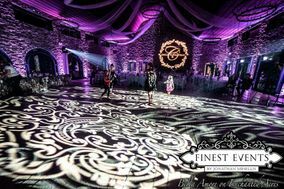 Finest Events is by far the best DJ around for so many reasons. For starters he is so much more than a DJ in my opinion! Jonathan becomes a family member/friend at the wedding and he gets everyone up and dancing and having a great time. The services he offers are the best around from the uplighting to the sound system and even a smoke filled dramatic entrance that my husband and I did! Living in a small town it’s hard to get that New York City wedding feel but the way he transforms a room is breathtaking. The wedding process can be stressful but Finest Events made our life easy by not having to worry about this part of the wedding, you can 110% trust him with the information you give him to turn it into a great time. Absolutely would recommend to anyone of any age and also music genre! Finest Events was the highlight of our wedding reception! Jonathan was purely amazing! His energy and everything he brought to the table was purely magic. We didn't have a wedding planner, but he made sure every minute of the reception was planned perfectly. From one event to the other, he did not leave one guest without having a good time! His lighting was also magical. He is our TOP recommendation for best DJ ever! We can't thank him enough for making Sept. 9, 2017 the greatest day of our lives! Jonathan was so wonderful to work with through all of our wedding planning! He listened to everything we wanted/didn't want and made sure it was all brought together seamlessly on the day of our wedding. Thanks to Jonathan, there was not one bit of hassle or worry when it came to entertaining our guests. He truly is a hometown legend and didn't disappoint! Awesome experience! Very professional and easy to work with. Kept everyone moving and the night going smooth. I would reccommend Finest Events to anyone! Jonathon is an amazing dj! I would deff recommend him to other people. I can't wait to be at the next event where he is the dj!! Jonathan is an amazing DJ who is easy to work with and extremely professional! Our guests were on the dance floor the entire night and we received nothing but compliments from everyone! We can't thank him enough for providing the best entertainment, lighting, and monogram for our wedding! There's really no question about it - book Jonathan for your wedding! You won't be disappointed, that's for sure! After attending many weddings with Finest Events as the DJ, we knew we couldn’t have anyone else for our own wedding. We literally choose our wedding date based on the availability of Jonathan and our venue. The DJ is who makes your wedding fun and memorable for your guests so it’s definitely not the place to bargain shop. Thanks for being a part of making our wedding day amazing! Jonathan was the perfect DJ for our special day. He was accommodating in every way and we got everything we wanted and nothing we didn't. Jonathan Mihellis could not have made our Wedding Day more perfect. He was incredibly professional, yet made every aspect of our Reception warm and personal. Our guests were on the dance floor the entire evening. Between the First Dances, the Parent Dances, and many other Family Traditions, Jonathan had the entire room engaged and ready to celebrate. We cannot Thank him enough for everything he did for us! I recommend Jonathan for any and every event you have. It will be a night you will never forget! My experience with Jonathan Mihellis and A Cut Above Music and Entertainment, was professional, accomidating and a perfect fit for what my wife and I were looking for. Jonathan brought our idea and his together to create party atmosphere to our reception. His willingness to use our personalities and his expertise, during our meetings, aloud everyone at our reception to enjoy themselves and made a night that my wife and I will always remember. If you trust in Jonathan's vision and have ideas of what you want, he will make it come to life. Thank You, Jonthan for all that you have done. Jonathan Mihellis was by far the BEST part of our wedding reception! My husband and I have been to other weddings that he DJ'd and always had a great time so we knew we had to book him. When we got engaged, the first vendor we booked (even before our venue) was Jonathan- we HAD to have him!!! He not only creates an AMAZING set of music but he is interactive with the crowd, holds your guests attention, and has complete control over the room. He's organized, planned out, and pays close attention to detail. His methodical way of DJ'ing is truly impressive. In addition to the entertainment, he also provided us AMAZING uplighting all throughout our very large venue. He also provided us with a beautiful monogram for the wall, two TV's which displayed a slideshow of photos of my husband and I, and my favorite was the video of clips my husband made interviewing himself the day of the big proposal. Jonathan knew how to make an epic party for us but still made it romantic and special. He gave us great ideas, met with us multiple times, took detailed notes, was professional in every way possible but also became our friend by the end of it all. If I could give him a 100 star review, I would! BEST DJ EVER--- HANDS DOWN! Jonathan was absolutely amazing. He was able to adapt to what our guests wanted and kept nearly everyone on the dance floor all night. Jonathan has a ton of different ways to customize your wedding: uplighting, monograms, monitors playing videos, dance floor lighting - that can really make your wedding unique. We got so many compliments on our monogram. We told him the night of our wedding that everything was absolutely perfect. He is an extremely fun DJ but also very professional. I highly recommend Jonathan. Jonathan was great! He really knew what to play to keep guests on the dance floor. He was very interactive, and even had to help teach us the electric slide! I got so many compliments on the monogram he made for us and he even added some extra hearts on the wall too. Jonathan is a phenomenal DJ. Kept in great contact with us throughout the Wedding Process, and even kept us on track with other facets of our wedding planning that he wasn't even involved in. Everyone that went to my Wedding complimented him, and said they've never been to a wedding where there were so many people dancing. Give Jonathan a call, you won't regret it! Jonathan was absolutely amazing! His DJ services will definitely not disappoint and your possibilities and endless when it comes to uplighting, monograms, and much more. The questionnaire really helps when communicating what type of music you want played and music that you don't want played. He spent a lot of time with us to truly understand what we wanted in terms of uplighting and our monogram. Our dance floor was PACKED the entire night! We couldn't have asked for a better entertainer on our wedding day!